Loving heavenly Father, I am really struggling in my business today – the economic climate has caused my thriving little enterprise to come to an almost standstill and I am finding that I am not in a position to pay some of my creditors and, what is equally concerning is that a number of people that owe money to me are withholding their payments, as they too are struggling. Lord I have no help but You and I thank You for all that You have provided so generously for me in the past - but I come to You today and pray that in Your grace You would bring a financial breakthrough to my struggling business – so that I will not go into debt and be in a position to honour the payments that I too need to make. Lord I pray that You would shine the light of You grace and peace on my little business today and thank You that You have placed me in this position of responsibility. I ask for Your blessing on each of my colleagues and all those who will cross my path during the course of today. May I be wise in my choices, fair in my decisions, honest in my dealings and may You be the one Who directs and governs my actions and attitudes during course of the day. Give me integrity in my dealings with clients, and wisdom, should there be any difficulties arising today. Oversee all the electrical and electronic hardware – the computers and all that we need to keep the business running smoothly. Loving Lord and heavenly Father, things are getting difficult throughout the whole business world and the same is the case with my own little business - and yet I felt led by Your hand to go into this line of work some time ago, and You have been very gracious to me for which I bless Your name. Father I know that all things come from You and Your set-up - but You also lay-aside when a job is completed. 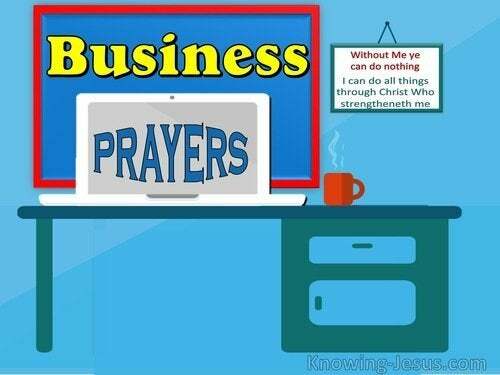 Look down I pray on my business – Lord it’s a failing business, for things are getting very difficult and there are times when I wonder if I should shut the doors on this work entirely – or labour to maintain it. So Lord I am casting this burden on You for You have called all those that are heavy laden to cast their burdens on You and have promised to carry them all – praise Your name. Lord, I know that unless the Lord builds that house, its builders labour in vain. Watch over all I do in my work today Lord and I pray for all those whom my life will touch today, through this work into which You have placed me. May I be a worthy worker, who has You as the director of my business and the one that oversees all my activities and transactions. Give me wisdom today in all the decisions I may need to make. I pray that I may demonstrate honesty and integrity in all my dealings - whether it is my relationship with people or my dealings with financial matters and the material side of my work.